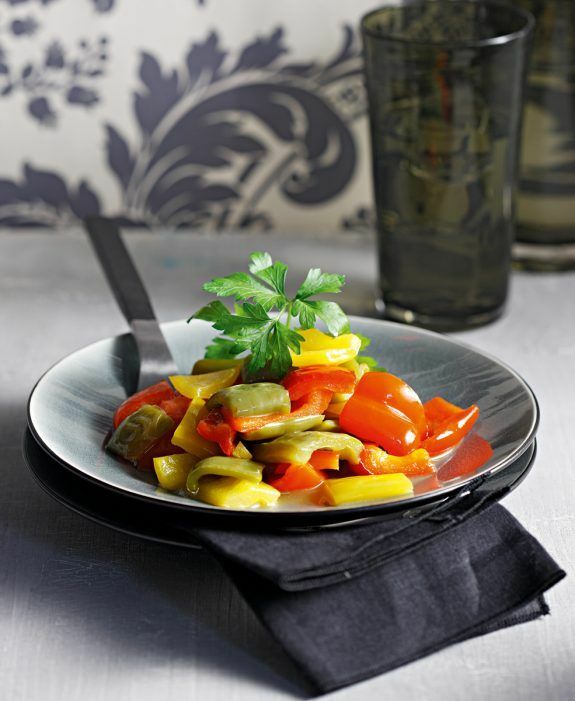 This warm sautéed bell pepper salad is the perfect side dish! If you want you can add some finely chopped garlic with the onion for additional flavor and serve with some grilled haloumi cheese! Make this elegant side dish for dinner tonight! In a medium pan heat oil on medium heat and cook onion for 2-3 minutes until translucent. Stir in peppers and cook for 3 minutes, stirring occasionally with a wooden spoon. Sprinkle with sugar and drizzle with vinegar and stir. Pour white wine and season with a little salt. When it comes to a boil, cover with lid and simmer on low heat for 5-7 minutes or until all liquid has evaporated and sauce has thickened. Serve warm garnishing with a couple of parsley leaves.